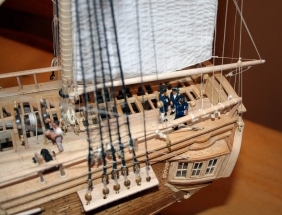 One of the Revolutionary War frigates, Raleigh was authorized by the Continental Congress in December, 1775, laid down in March of 1776 and launched in May of the same year, a remarkably short time for construction of a frigate. 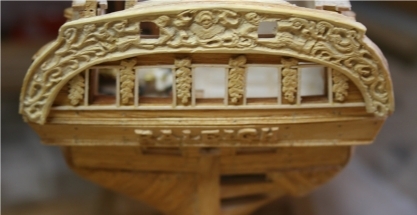 Designed and built by Hackett, Hill, and Paul at Portsmouth, NH, the Raleigh appears on the great seal of the state of New Hampshire. Raleigh put to sea in August 1777 under the command of Thomas Thompson in company with the Alfred (24 guns). 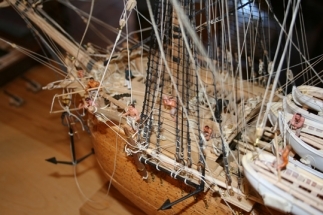 The two ships sailed the Atlantic and captured several prizes, but in March 1778, while they were separated, the Alfred was captured by HMS Ariadne (20) and HMS Ceres (16). Thompson was accused of cowardice and dereliction of duty in the loss of the Alfred, relieved of command, and replaced by John Berry as commander of the Raleigh in June of that year. In September 1778, Raleigh sailed in convoy for Portsmouth, VA. En route, they encountered the HMS Unicorn (26) and the HMS Experiment (50). Barry sent the merchantmen to port and drew off the enemy in a 7 hour running fight which ended when the Raleigh ran around. 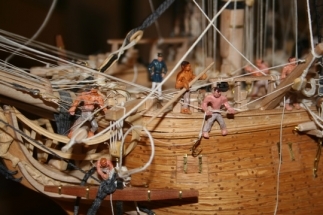 Barry evacuated the crew to shore and ordered a party to destroy the ship, but this order was thwarted by Midshipman Jeacocks who struck the colors and surrendered the ship to the British. Raleigh was refloated, repaired, and taken into the Royal Navy as HBMS Raleigh. She participated in the capture of Charleston, SC in 1780. In 1781 she was decommissioned in England and sold off in 1783. 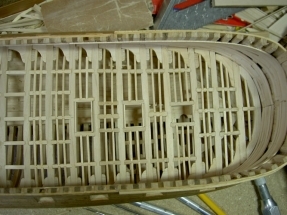 The model is in 3/16” = 1 foot (1:64) scale. The original Hahn plans (1/8”=1ft) were enlarged, and the hull constructed in the “Hahn method”, that is, upside down on a building jig. The frames are hard maple. 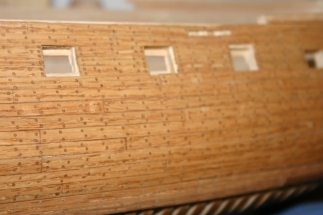 The hull planked in red oak. 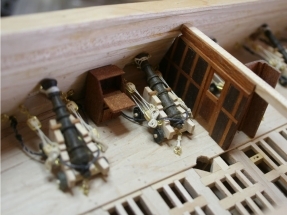 Planks are fastened individually using wooden pegs as shown in the picture details. 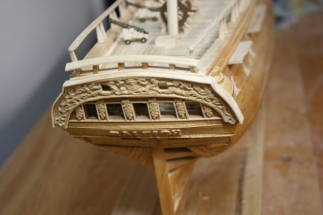 The deck beams and most detail work is maple. 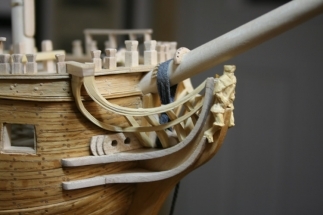 The stern carvings are boxwood. 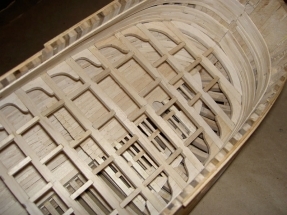 The boxwood was obtained from a neighbor in Virginia around 1996, when some American boxwood hedges were removed, dried for several years and milled to suitable dimension. 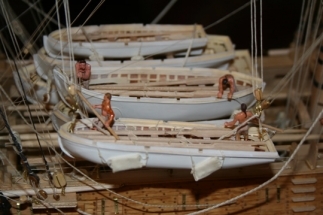 Boxwood was also used for the carved figures of the crew and officers. 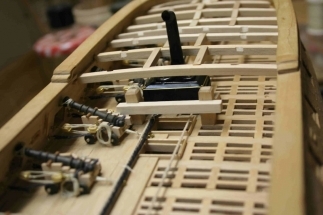 The masts and spars are hard maple. 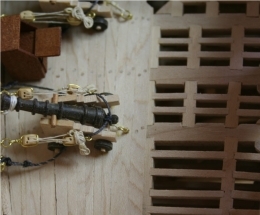 The cordage is made up from cotton threads using a home-built “rope machine”, the design for which is adapted from one used by Robert Sumrall at the USNaval Academy model shop. 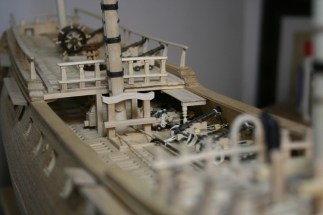 The model is entirely scratch-built. No purchased fittings have been used. 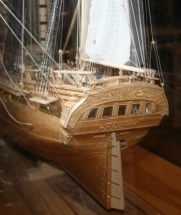 The ship is shown as she might have looked when setting out. The crew has weighed the anchor and are about to fish it at the cathead and stow it on the portside channels. 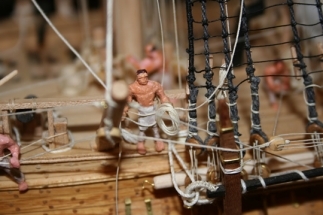 Other crew are bringing aboard the last remaining ship’s boat and stowing it, while foretopmen are stowing the ropes used to furl the foretopsail, which has just been released. The officers are on the quarterdeck reviewing orders. Two marines stand guard at the front of the quarterdeck. The model is in a custom walnut case with acrylic glazing and LED lighting. External case dimensions are: 43″ wide x 38″ high x 18″ deep. 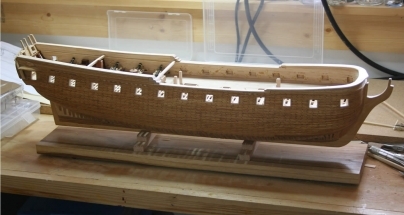 One nice thing about using the Hahn method, is that it is particularly good for models that may spend a great deal of time on the shelf or being moved about. I built a box to hold the model, much as Hahn described, and it served well to protect and store it over a three year construction hiatus.